Who are F Curry & Sons? 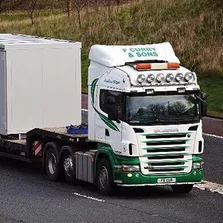 F Curry & Sons are a family owned road haulage company, based in Keady, Co. Armagh. Francie has been driving lorries since 2000. 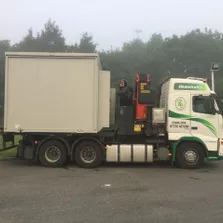 He decided to branch out with his own haulage business in 2004, which has a highly successful niche in the haulage market from Ireland to UK and UK to Ireland. Good communication is a vital part of F Curry & Sons and their aim is to provide a reliable, efficient and high quality logistics solution to go that extra mile. They ensure their customers are provided with a quality, value-added service, from collection to delivery. 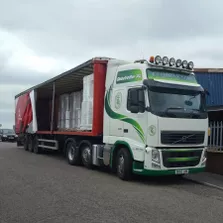 F Curry & Sons boast a comprehensive fleet with flat trailers, lowloaders, curtainsiders, Euroliners and Bulk Open Top Curtainsiders available for specialised or groupage transportation, which may require the use of our moffett mounty forklift for loading and unloading. A ridged and articulated hiab lorry with crane lifting facilities is also available. Our drivers are all trained to a high standard and are certified for strapping, chaining and covering loads. In addition to a highly flexible range of service the company has developed the specialised ability to handle fragile loads and awkward consignments. Our lorries are equipped with safety stickers, fire extinguishers, first aid kits, flashing, warning and hazard lights etc while on the paper work side we keep up-to-date maintenance records, daily and six weekly checks. Going above & beyond for all of our customers! Receive a service like no other. Copyright © 2017 F Curry & Sons - All Rights Reserved.